STRUMIS Management Information System software is the leading MIS system for all steel fabricators. With numerous blue chip steel fabricators of all sizes utilizing STRUMIS in their businesses; providing them significant cost and time saving benefits across all departments. We’re equally proud of our ability and proven record to transcend globally. We have clients all over the world, and never fail to offer quality service wherever they may be. Our feature-rich software program continues to develop and grow, in line with an ever changing industry and our clients’ needs. The origins of this successful steel company can be traced as far back as 1882, now standing proud as having the largest structural steel production capacity in Nebraska. 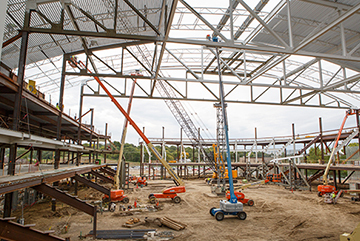 With three major locations and divisions (structural, rebar and mountain steel), and boasting a staff of experienced Project Managers, alongside their specialist engineers, Drake Williams Steel can literally service anyone in the Midwest USA. Their main services include railroad products, concrete reinforcement, contract fabrication and structural steel. Offering a full and complete service, along with AISC certification, Drake Williams Steel provides structural steel packages for a diverse range of clients, all with an emphasis on both value and quality. In short, Drake Williams Steel needed a package that wasn’t going to let them down: "STRUMIS was a proven solution on the technology platform that we trusted”, Jon Eden from Drake Williams told us. And it was the multi-location feature and this proven track record that were the main selling points. Wherever they are, our STRUMIS clients get a product that’s uniquely designed by the industry for the industry. As engineers with 25 years experience, you could say we know exactly what we are doing! That’s why the level of real-time accuracy, intelligence, efficiency (time and cost) and control, all set STRUMIS aside from the competitors. 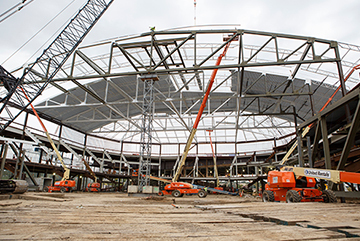 One of this steel company’s most recent achievements is the new arena for the University of Nebraska at Omaha which they helped build…..
STRUMIS and its various global offices , including US-based office, STRUMIS LLC, has been providing best practices software solutions to the steel industry for nearly 30 years. With over 800 customers, a team of more than 100 people and 24 developers ensure STRUMIS software meets the latest and future requirements of the industry and its leaders.